FotoSpin provides a unique touch and spin control experience to user. User can make the photo spin and flip when selecting different photo. The animation is smooth and outstanding. This component was developed by using the Papervision3D API. 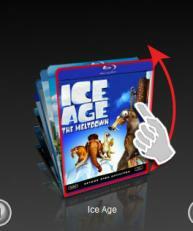 It shows a real time three dimension look and I can control the view angle of the album in 3D space. Save a lot of workflow time when use with Adobe PhotoShop. CurveMenu CS supports build gallery from PhotoShop. Use the Export Web Gallery function in PhotoShop and use the fallery with CurveMenu CS. The new preset manager allow you to save the setting in to a preset file. You can reuse the preset file in different project.